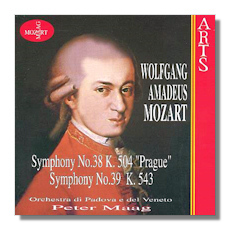 These two discs have been reviewed on this site previously as part of Maag's Mozart box (Arts Music 47560-2), but should you wish to sample, these two discs are wonderful reminders of just how great an artist Peter Maag was. Mozart and Mendelssohn were his specialties, and late in his life he collaborated with Arts Music to give us his most important recordings since his early years with Decca. Despite not working with top flight ensembles – he had previously enjoyed a working relationship with the London Symphony Orchestra – his recordings in Madrid and here with the Orchestra di Padova e del Veneto are all full of warmth, vitality, and a lifetime of knowledge. This is Mozart at his old-fashioned, big-hearted best. Sure, the music moves slower than modern listeners are used to, but the flow of these works is like water. Maag whips this provincial band into shape, demanding both clarity and virtuosity. Unlike his Beethoven in Madrid, which is highly engaging but somewhat lacking in collective polish, the Orchestra di Padova e del Veneto produces a beautiful sound on both discs, allowing us to focus entirely on Maag's unfailing musicality and ability to infuse all four scores with new life. Listeners expecting the Vienna Philharmonic Orchestra will likely be a little disappointed (the brass here is good if not especially golden-toned) but there is lovely music happening here regardless. Besides, the end result is so much more engaging and idiomatic than what usually comes out of Vienna and Berlin that it hardly matters. 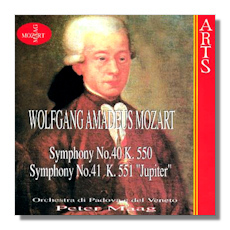 The disc with Symphonies #40 and #41 might just be one of the best on the market. From the first time Maag leans into the famous theme of the G minor Symphony, its clear that this is a reading full of personality. And so it proves, with highly alert playing melded with some simply terrific Mozart conducting. In the "Jupiter", accents aren't as crisply dispatched as we are accustomed to as modern listeners, but better a beefy, rich sound than ugliness. There's plenty of times too numerous to count where Maag effortlessly foreshadows the reign of Beethoven, and the modernity of the piece isn't lost on either conductor or orchestra. Arts Music provides fine sound to complete a near ideal package of great value.